The Santos GLNG plant on Curtis Island has achieved another key milestone, with all modules for the first processing train now installed. The last of 82 modules for the gas liquefaction train was installed last week, bringing the plant closer to first gas. The Santos GLNG project is now more than 80 per cent complete, according to Santos managing director and chief executive David Knox. The project will ship first gas cargoes in 2015, and will deliver about 11 per cent of Korea’s domestic gas needs and nine per cent of Malaysia’s needs for the next 20 years. Santos has already shipped first cargoes of gas from the PNG LNG project to Japan earlier this month, on the Spirit of Hela tanker. 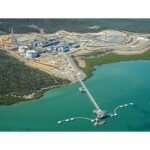 Santos expects to ship cargo from PNG LNG every four to six days, for 30 years to buyers in China, Taiwan and Japan. Knox reassured members of the Brisbane Mining Club that China’s demand for Australian gas will be strong, despite ongoing expansions into the global market by the US and Russia. “The gap between supply and demand by 2025 is around 100 million tonnes of LNG per annum,” he said. “The end result is not a market that can be met by one or two countries alone. “US LNG will be important but not a silver bullet. “And pipeline gas from Russia will also play a role but will only meet around six per cent of China’s gas demand by 2030. 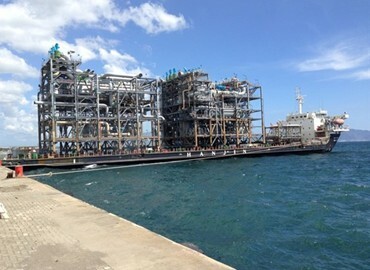 Knox said that the gas industry in Queensland represents the fourth largest LNG producing region behind the rest of Australia, Qatar and Malaysia. The industry has been projected to contribute more than $12 billion in national tax revenue annually.